****An exclusive interview with the former President of the Democratic Republic of Timor-Leste, His Excellency Dr José Ramos-Horta. 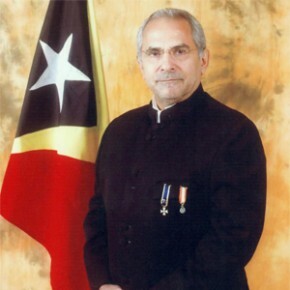 Two decade later, East Timor gained its independence, and Ramos-Horta accepted the position of Foreign Minister. Holding a strong reputation of commitment and care for his people, and after reconciling with Indonesia, he began planting the economic seeds of his country. With guidance from Prime Minister, Mari Akatari who headed the first government after independence, Ramos-Horta negotiated a “win-win arrangement” of oil and gas revenue-sharing with neighboring Australia. Both nations signed the Timor Sea Treaty which gave ninety percent of the revenues to East Timor. The Petroleum Fund of 2005, modeled on Norway’s sovereign wealth fund, ensured sustainable use of its revenues. By October, the Fund secured $11 billion in oil investments while the Norwegians reported an $80 billion loss. “Our teachers lost because they invested in U.S. Treasury Bonds,” during the global recession when the U.S deficit increased and U.S. dollar weakened, wrote Ramos-Horta. The Fund has accounted for greater economic stability ever since. The Fund has fed the national budget, of which eighty nine percent was used to finance the “fruits of freedom, such as clean water, electricity, schools, health-care, roads, and food security,” he wrote. Additionally, cash transfer programs for aiding the poor has distributed cash directly to widows, orphans, handicapped, resistance veterans, and to individuals over the age of sixty. Empreza Di´ak, a non-governmental organization partially funded by Ramos-Horta, helps to close the poverty gap. The social business comprised of mostly private sector professionals, design, implement and manage market-based solutions for risk averse populations—40% of whom live below the poverty line. “They developed systems for a range of locally made products, namely dried fish, salt, algae, rubber and coffee,” wrote Ramos-Horta. Equipping and training over three hundred fishermen that produce dry fish, Empreza Di´ak applies innovative solutions to their production and marketing, including market access and scale. Compared to average weekly salaries of under seven dollars, “fishermen’s weekly income has increased from $7 per week to $82.50 per week.” Beyond self-sustainability, communities empower others and bring positive social impact for a nations where the majority of the young entering the job market on average are nineteen years old. Since his accession for prime ministry in 2006, and then for presidency in 2007, East Timor has experienced yearly double-digit growth. The World Bank and IMF have reformed the tax system which Ramos-Horta has worked to simplify. On the current tax regime, he has the fortitude to say, “we have the lowest taxes in the region (after Hong Kong), with a 10% flat income tax.” Investors, taking advantage of lower taxes are pouring into the country, but the nature of bureaucracy halts investments. “We still have a cumbersome and inefficient bureaucracy and it takes far too long to register a simple company,” he wrote, explaining that property law and land issues hinders development such as the construction of new hotels. According to a recent World Bank country-ranking report, East Timor’s rank at 168 is attributed to “gaps in land law, land and property registration, leasing and collateral, bankruptcy, licensing, accounting and auditing, competition policy, intellectual property rights, social security, and key sectoral legislation in areas of tourism, manufacturing and trade”. In spite of the challenges, Ramos-Horta is proud of his country’s achievements. Peace-building through dignity, respect and appreciation for the East Timorese and its neighbors, brought the country from “ashes” to a democratic nation-state. After ten years of independence, East Timor is free from sectarian, ethnic, or religious tensions, and organized crime. Reflecting on disputes in neighboring Thailand and in the South China Sea, he connected to his tough spine, and noted, “I believe we can contribute to turn Asia into a region of peace and fraternity.” But mentioned, “Peace does not come about though formal agreements; enduring peace must grow within ourselves as individuals, in our communities, and in our societies and nations.” Hopeful and optimistic about the future, Ramos-Horta can finally enjoy the new waves of peace.